Yesterday, federal authorities announced 50 indictments of college personnel, wealthy parents, and fixers who ran a multi-million-dollar bribery ring that ensured that the slow, plodding, undeserving fruit of wealthy grifters' loins could be admitted to the top universities in America. On the one hand, this isn't exactly a surprise: after all, our dimbulb of a president somehow attain admission to some of the nation's leading educational institutions, despite scoring such dismal grades that he paid a lawyer to threaten his alma maters with civil and criminal liability if they ever disclosed them. On the other hand, "Don't savvy me" should always be our watchword when something everybody knows gains official recognition. 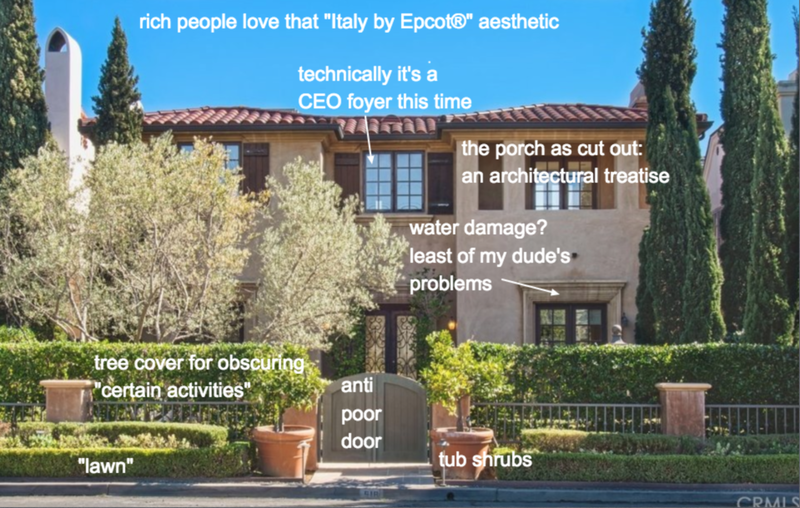 In that spirit, I was delighted to discover that Kate "McMansion Hell" Wagner (previously) had somehow obtained exterior and interior realtor listing photos of the revolting Newport Beach, CA home of William Singer, accused of masterminding the college admissions crime syndicate through his Key Worldwide Foundation, which allegedly laundered payouts to coaches and others. Singer has reportedly had to sell off the house in the wake of a scandal, but through Ms Wagner's brilliantly annotated photos, we can get a glimpse into the rarified existence of someone whose belief in meritocracy was so strong that he was willing to cheat to get the children of the wealthy the positions that poorer children had earned. Please note the decorative color-coded books and the sad ukelele casually draped across a stack of dictionaries, both of which are totally used by the residents.